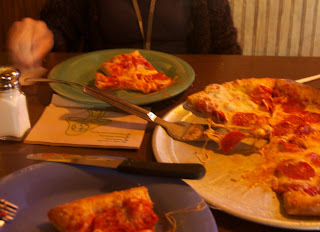 Anytime is a good time for pizza. At home, there is homemade pizza on Friday and Sunday nights. Then there's a green salad and a Coke makes the meal a true joy. When traveling, pizza doesn't always fit into our schedule. But on a Sunday night in May, during our journey on the way back from the East Coast, that Italian goodness fit our schedule. We were in Blowing Rock, NC having spent about 10 hours that day to get to our destination. 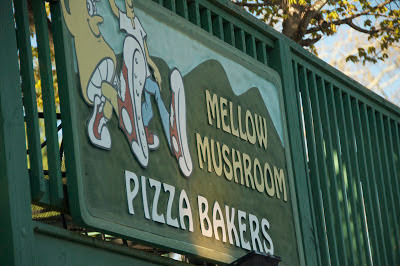 There were a number of interesting locations in the area, but since it was Sunday night -- what else but the Mellow Mushroom Pizza Bakers. Wifey and I walked about two blocks from our motel to enjoy our favorite Sunday night meal. The tourist season hadn't apparently heated up that much in early May and we were able to get in and easily get a table. This time is was just pepperoni and cheese pizza along with a Coke. That was it. The interior was rather interesting, having wall art of various entertainers including Bob Dylan. And overlooking the interior from the second floor was the biggest entertainer of all time -- Mississippi's own Elvis. We felt at home.